Those who travel internationally know one thing all too well: getting through customs can be a time-consuming, frustrating endeavor. But for U.S. residents, the Customs and Border Protection (CBP) Global Entry program offers expedited clearance, delivering a degree of relief for the weary world traveler. Through the program, pre-approved, low-risk travelers enter the country through automated kiosks at select airports, usually avoiding long lines and delays. While Global Entry is great for people, what about goods that enter and leave the U.S.? With international trade growing rapidly, how can exporters and importers expedite the movement of their products through CBP? If your business imports products into the U.S., then you are especially aware of the need for fast border clearance. You understand that a delayed shipment can generate a chain reaction of bad outcomes, damaging your brand, angering your customers and hobbling your organization’s financial performance. Whether your business imports small electronic parts for products assembled in the U.S., home goods to be sold directly to consumers, large machinery for commercial use, or any other product, you know that speed of delivery is essential to success. 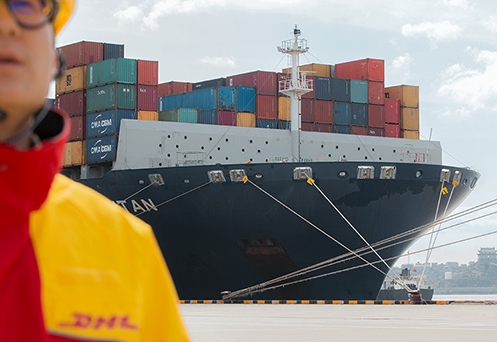 At DHL Express, we know a thing or two about doing things fast and efficiently on a global scale, and pushing for advances in customs processing is part of our overall effort to maintain the most efficient delivery system on the planet. In fact, the call to modernize the border clearance process for goods entering and leaving the U.S. is not new, but it has gained new momentum in recent years. The CBP has been working closely with key business leaders and experts in the logistics and shipping industry to develop new processes that will make border clearance faster, easier and more secure. DHL, for instance, serves with other industry leaders on the CBP’s Advisory Committee on Commercial Operations, which provides input on key issues including supply chain security and facilitation, CBP modernization and automation, air cargo security, customs broker regulations, and trade enforcement. Partnering for success: On a typical day, the CBP notes that it processes 70,334 truck, rail and sea containers. Along with CBP, 47 U.S. government agencies are involved in trade, and overall, more than 200 different forms for import and export may be involved. Obviously, the process is complex, and so companies look to experienced logistics experts, including customs brokerage services, for assistance. Your logistics partner should be perfectly in tune with new regulatory developments, and will make sure all of your documentation, and licensing when needed, is in order. In addition, your partner may offer advanced services including compliance assessment and audits, training and education for your staff, and duty and tax management. Of course, services will also apply to the customs process in your destination or origin countries, where different rules and procedures are in effect. Embracing automation: The clearest way to streamline the complex CBP clearance process is through automation. CBP’s move to automation through a single window system is already well underway. The Automated Commercial Environment (ACE), which should be fully operational in 2016, is designed to consolidate and streamline the export and import process, providing one automated system for entry processing, cargo release and export processing. Without ACE, a paper-based system requires importers and exporters to submit the same data to different agencies, and it requires the same information to be keyed in manually to multiple electronic systems. With ACE and the single window, information can be submitted and processed quickly, and then used by multiple government agencies for review and clearance. Importantly, in the future, automation should allow for better cooperation among customs agencies in different countries, so that information can be shared for faster and more secure border processing on a global scale. Expediting efficiency: Like Global Entry for travelers, the CBP’s Customs-Trade Partnership Against Terrorism (C-TPAT) program provides an avenue for certain importers to receive expedited processing benefits. Companies that apply to participate in C-TPAT must undergo an evaluation and security assessment, and if approved, can expect, among other things, a reduced number of CBP examinations of their shipments, shorter wait times at the border, and eligibility to participate in other U.S. Government pilot programs, such as the Food and Drug Administration’s Secure Supply Chain program. The CBP is also in the testing phase of a new Trusted Trader program that will expand C-TPAT. Focusing on your industry: All too often, imports are delayed because two different ports of entry may apply different standards to the processing of the same goods. An importer may bring goods through different ports, use the same procedures and compliance practices, but receive different results. To increase uniform practices, and to help companies understand the specific rules that apply to their industries, the CBP runs ten Centers of Excellence and Expertise. The Centers are designed to assist businesses, improve CBP functionality and resolve problems. Advocating for the future: Talking with logistics experts and exploring the resources available through the CBP’s website and through the International Trade Administration’s website are good places to begin to truly understand the border clearance process. But to make process better, companies need to be advocates for modernization. One of the best ways to do this is by adding your voice to those who support new free trade agreements, which serve as critical vehicles for the streamlining and coordination of customs practices on a global scale. How is your business managing the border clearance process? Let us know at @DHLUS.